The King Power Duty Free shop at Bangkok Airport, don't look or touch just in case. Yet again, Thailand is in the news for the wrong reason, the mononity of these kind of stories is getting depressing. The latest is the Ziog Zag scam at the new airport at Bangkok. Basically, with little cause you can be accused of shop lifting from one of the duty free shops run by King Power. Whether you are guilty or not. In one case a professional couple from the UK were taken to the local nick when it looked like the lady had put some make up in her bag. Once in the cell they were given an interprrtor who explained that normal Thai justice could take weeks and months, but for a large sum of money the charge could be brought forward and evryone would be happy. So this couple went to the ATM and transferred the rest of the money. They were released and the charges were dropped. Upon their return to the UK they contacted the BBC and spalshed the news nationally. This bought a flood of other tales on the same subject, in one case the large sum of money direct into the top coppers bank accounts. What as the Thai goverment done about this? Nothing!!!! as usual. Sod foreigners, we only need their holiday cash, tough if they get ripped off. This month began with a flurry and sort of wimped out. Using www.pattayaone.net as a source the biggest up turn is the chance of being mugged at night on Beach Road by Lady Boys, the incidents have gone way up this last few months!! Not so good for the Germans!!!! Famous cornish chef and restaurantor Rick Stein is currently doing a series on BBC2 about the food and people of south east asia. Last night Rick was in Thailand, he visited Bangkok and Phucket. It was actually an excellent program and really showed Thai life as I know it. The food he cooked made me miss Thailand and wanting Nuch to cook more of it. The series can be caught on BBC iplayer, if you haven't used this service before, its good. This will be available for 3 more weeks on i-player. I like to think Nuch and I are bringing Elizabeth up ok. At the moment she as no concept of money, only that we have to save pennies to buy her things. 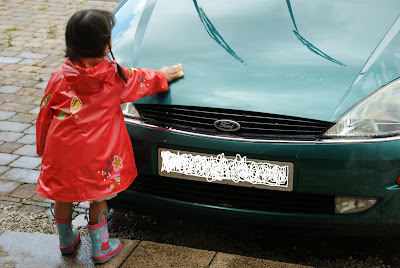 Trouble was the following day she wanted to clean it again to get her money. Last night I diagnosed myself with shingles. It startes with what I thought was a pulled muscle in my back and when I swallowed I could feel every gulp! I had a a row of large spots on my chest and back which I put down to sweat and hard mucky work. Out of the blue I thought about shinles, I looked on Wikipedia and my symptoms matched. I didn't realise that its a nervous complaint, when you have stress and your body is run down, the last six months has been very stressful and my new job is very strssful at the moment. Hopefully in 3 - 4 weeks the spots should subside and i'll be back to normal. Months ago I promised Elizabeth that when she did a poo on the big toilet, I would buy her a bike, well the deed as been done and the bike as been bought. She loves the bike and took to it straight away, better buy some pads to go with her helmet. I started this blog just over four years ago and 528 posts later its still going. I've ried different formats and different blog sites, but I think i'll stick with this one now. The first entry was a bit ropey (they still are), I wanted to show pople my life, the best post that year was left till the end, with my review of the year. 2006 was the year my life changed for ever with the birth of Elizabeth, she is without doubt the best thing to happen to me, also that year I lived through a military coup, luckily bloodless. 2007 saw the big move back to the UK, with Nuch following me a few months later. I wuld like to think Nuch was happy over here, but I think her heart is still in Thailand, as you would expect. A nice stable year was 2008, Elizabeth grew up quickly and fell down just as easy. Thailand was never far out of the news, fresh troubles with politics and civil unrest. 2009 hasn't been the best year so far, hopefully all that will change soon, I have a new job with a new, young company. 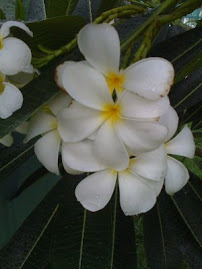 We have been back to Thailand and stayed at the Dusit Thani in Hua Hin. Possibly the finest hotel I have been to, visit it if you ever get chance. Thailand is again in the news and not for the right reasons. Please sort it out soon, its killing your country. So here's to next four years, although i've stopped looking ahead tha far now. Chokchai is a superb steak house chain in Thailand, they have a farming project near Khao Yai and luckily for me, a restaurant near Future Park in Rangsit. They also have a restaurant in Bangkok, on Sukhumvi soi 23. It has a sort of western/farming theme and sometimes can be very full and you'll have to wait. They have three types of steaks. They are your run of the mill steak, then better quality meat which is what I usually have and then a steak that as been hung and dried for a good time and supposedly tastes fantastic. Pretty pointless for me, I like my steak well done. They also do Salmon, Chicken, Lamb and Pork, all very nie and servd with chips or jacket potato,my favourite is the T-Bone, they're massive and taste superb. One thing not to miss is the homemade milk ice cream, sooo nice! Mark Cavandish won stage 3 of the Tour de France today! His team were superb, so good that they split the field and gained 41 secs on the main bunch. The hand up to the ears victory salute which Mark performed, was for the benefit of one of his team sponsors HTC. Should get a shiny new phone for that one. It was annouced today that the organisers of last years shut down of the two Bangkok Airports are to be prosecuted to the full extent of the law. Basically committing acts of terrorism against the state. The foreign minister, a top general and the leader of the new yellow shirt political party have all been named. At first sight you think that Thailand is at last making somebody pay for the disruption. 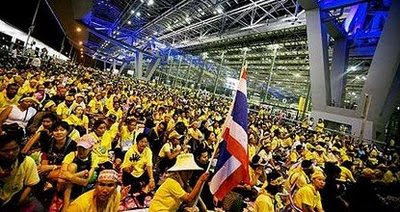 However this is Thailand, the current PM is courting votes in the North and wants to show he is doing something against the yellow shirts, also the yellow shirts have just started a political party and would be an excellent rubbishin tactic. I'll show my arse in Burtons window if anyone of substance is actually bought to account, even though in any other country they would have the book thrown at them. Mark Cavandish as won the sprint for the 2nd stage of this years tour, well done!!!! This years edition of the Tour de France as started with a 15km time trial around Monaco in the south of France. This years race is a very difficult course and there are at least 6 guys who could win the race. 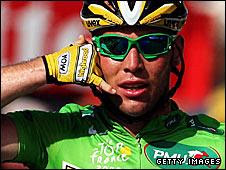 Also this year see's the return of Lance Armstrong to the field, if he wins it will make him the greatest athlete in hiostory, and thats no joke!! All UK eyes will be on Mark Cavandish, he one 4 stages last year, lets hope he gets even more this year. The above picture was taken of Elizabeth. She really loves water and playing and her weekly excursions to my sisters house is a high light for her. Elizabeth is the apple of my eye, I love her so much. 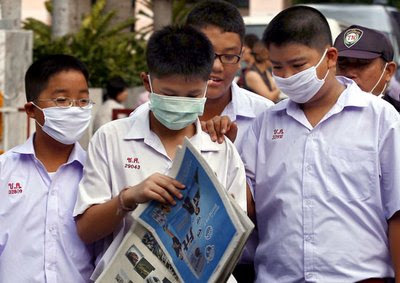 Swine Flu as really taken a grip in Thailand. Nearly 1500 certified cases and today the fifth death was annouced. Why Thailand is being affected more than other, i'm not sure! Hopefully it soon dies down and there are no more fatalities.